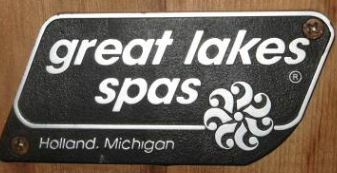 Great Lakes Spas was taken over by Emerald Spas in 2007. Emerald and Great Lake Spas are no longer in production, but Hot Tub Outpost carries factory original replacement parts and accessories for both brands. Great Lakes Spas were originally manufactured in Vista, California, but were later manufactured in Grand Rapids, Michigan once they were under the Emerald umbrella. See most every Great Lakes part we offer. 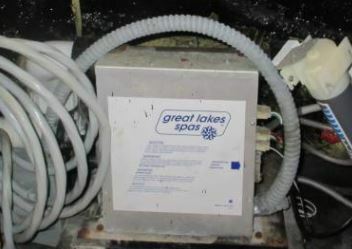 See our Emerald Spa parts for compatible replacement parts for your Great Lakes spa. The filters are the same for Emerald and Great Lakes spas such as the 35 sqft 9 1/4 inch long filter. See our Filbur Filter section for all filters. We have most all of them, so contact us with your particular information and we will get you the best price on a replacement circuit board, control panel or complete spa pack system for your Great Lakes hot tub. We offer the Great Lakes ML400 4 button panel as well as the 510E and 520E panel. Need the VL600 style 6 button control panel, we have those too. The smaller 4 button panels are the Lite Digital Duplex type. That smaller oval panel may be an MVP260 4 button panel. We have them all. Factory original control panels for Great Lake spas include the 4 button Great Lakes control panel 51001100 . We offer factory original overlay graphics for the control panels as well. These just stick on to the control panel to map the correct button layout for your particular spa. We offer the 120v replacement air blower that comes with AMP 4 pin cord included. We offer a wide variety of factory original replacement pumps for Great Lakes spas. Find the info from your current pump label which may include the voltage, horsepower rating, amp draw, 1 or 2 speed pump and frame size. You will also need to know the connection size (usually 2 inch plumbing, but could be 2 1/2 or 1 1/2 on certain pumps). We offer every type of replacement heater for Great Lakes spas whether you have a Gecko or Balboa control system installed. For instance, we offer the Gecko IN.XE 4kW 240V heater. These are all factory original Emerald/Great Lakes replacement heaters. We offer a wide variety of replacement Great Lakes jets, valves, suctions and plumbing parts. Replacement jets available in graphite or stainless steel finish. Jets are available in gray and stainless steel for most Great Lakes spas. Sunlighter is a popular round hot tub model. We offer a wide variety of parts for this spa including the filter basket 90016587 , the floating weir 90016687 for the filter assembly and even the topside control panel 90049000 along with the factory overlay 90049100. Of course our plumbing shoppe has all the PVC parts needed to fix any leaks in the plumbing system. We also feature most of the replacement jets depending on size and style needed. Great Lake Spa models range from 2 person up to 8 person in size. These spas were available in a mid-range Deluxe Series or the Excel Premium series with upgraded features like ozone systems, stainless steel jets, waterfalls, premium cabinets and upgraded light packages. The smallest model was the GL35, which fit 2-3 persons, had a lounger, 19 jets and 1 spa pump. The Sunlighter is a round, budget model measuring 79" in diameter, with a multi-level bench, seating for 5 and 23 jets. Model GL3 was a rectangular spa seating 3-4 persons, with 17 jets, 1 spa pump and a lounger in a 78" x 60" x 32" shell Great Lakes spa model LG4 had room for up to 5 in a 78" x 68" x 32" open seating hot tub with 1 pump and 21 jets. Model GL 5 was a 78" square hot tub with a lounger, 2 spa pumps, room for 5 and 32 jets. Model GL6 was the same - but with bucket seats and a multi-level bench. Model GL7 was a rectangular 90" x 79" x 36" hot tub with contoured seating for 7, 48 jets and 2 spa pumps. The largest Great Lakes Spa model, the GL8, was 90" square with 60 jets and room for up to 8 persons. Contact us at support@HotTubOutpost.com if you need assistance in finding the right spa part or accessory for your Emerald Spa hot tub - send details/part number/even a picture along with your request if you like. We know you'll want to get back to enjoying your Emerald Spas hot tub, so we'll get back to you quickly. Or you can complete the Great Lakes Parts Finder information and a parts match tech will review your request.